In small bowl, beat tomatoes, chipotle chiles, chili powder, cumin, 1 teaspoon salt and the pepper with whisk. Spray 3- to 4-quart slow cooker with cooking spray. Place chicken in slow cooker. Pour tomato mixture over chicken. Cover; cook on High heat setting 3 hours or until chicken is tender. Meanwhile, in small bowl, beat water, vinegar, sugar and 1 1/2 teaspoons salt with whisk until dissolved. Place onion in small bowl; pour vinegar mixture over onion. Let stand at room temperature 1 hour; drain. In slow cooker, use two forks to shred chicken. Using slotted spoon, divide chicken among rolls. Top with a few of the red onion slices, a sprinkling of queso fresco and a few slices of avocado. Serve immediately. If you can’t find queso fresco, which is a mild, white Mexican cheese, Monterey Jack can be substituted. Chipotles in adobo are smoked and dried jalapeños rehydrated and canned in a sweet and tangy purée of tomato, vinegar, garlic and other spices. You can often find them in the ethnic aisle of the grocery store. 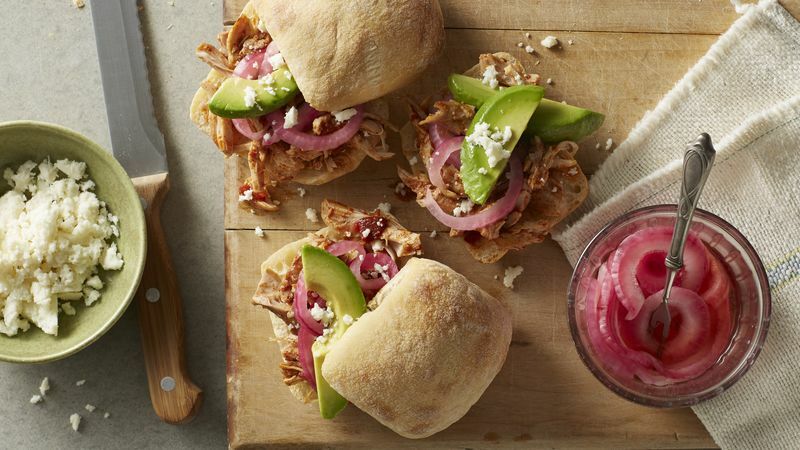 Crusty rolls work best in this recipe -- they'll hold the juicy chicken mixture and keep the roll from becoming too soft.